One example he gave that stuck with me quite well, was the typical email registration process, when signing up for a new user account. You provide an email address, but before the account can be activated, you need to verify the email address using a verification email. However, using Terracotta, you're able to defer saving the email to the database until verification is complete and thus you can keep "state" information out of the database. Afterward, I listened to Charlie Hubbard's talk on GridGain. This was an interesting talk in that GridGain is tackling distributed computing from a different angle than Terracotta. You are basically using it to farm out little chunks of data that are then processed by those nodes. It feels very reminiscent to using JMS with Publish/Subscribe with some processing logic bolted on. The last talk I visited was on Jared's Richardson's talk on 'using agile to optimize' which was a good talk. It reminds me that I still need to read his book Ship It! I cannot believe that already two weeks passed by since the Atlanta DevNexus conference. Since then I have been quite busy learning Flex. My desire to explore Flex started back when James Ward talked at one of our AJUG meetings several months ago. Unfortunately, beyond some initial explorations, I never found the time to make the next leap forward. In terms of that, JavaFX has potential in my opinion. While it comes with its own scripting language you are still able to use the the full breath of exisitng Java libraries. Unfortunately, JavaFX does not seem to be there, yet. While some of the example application look nice, it still lacks some important pieces, e.g. lots of standard components. At the end of the day, most developers are building business apps and thus need standard components for datagrids, charting etc. And therefore, by the end of the conference I was mostly convinced that Adobe Flex is the best technology at the moment for delivering rich internet applications. 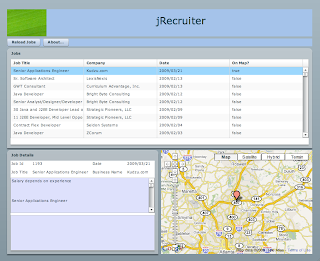 Don't get me wrong, I still hope that JavaFX can make it and maybe IBM fancies with the idea of becoming a player in that area and provides some more resources once BlueSun is born. Nevertheless, once the conference was over, I made the decision to take the Flex deep dive. I mostly finished reading Learning Flex 3 and I just started reading Pro Flex on Spring. For both books I am planning on publishing book reviews soon. 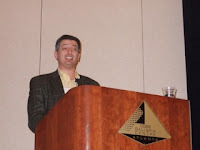 Originally we did not plan on recording the sessions during DevNexus 2009, but thanks to the help of Stephen Davis we are able to provide recordings of ten presentations. The quality could be better but I think the presenter is mostly intelligible. The recordings are available here. By the way the slides are available here. I will try to provide some more details and impressions about the attended talks in the next few days. Stay tuned. I hope that within the next couple of days, we will be able to make the remaining presentations available as well. I went through the exercise of internationalizing (I18N) my home project. It is still work in progress but I added support for German in most places. Unfortunately, I got a bit bitten by the fact that by default properties files in Java have to be encoded in ISO-8859-1. Up to today, all web applications I helped developing, were created for an English speaking target audience, and therefore, even though they often used properties files, they never went beyond the standard character set. Nevertheless, the limitation that properties files by default are not cannot be in UTF-8 is quite annoying, as it would require you to escape special non-ISO-8859-1 characters or use a conversion tools such as native2ascii. This blog post summarizes the general issue nicely. Unfortunately, as mentioned above, it looks like there is not an easy pluggable way of convincing Struts 2's textprovider to use Spring's messageSource implementation. As I am already using Spring MVC for some of my actions, I decided to use Spring's message tag within my JSPs, I am not crazy about it, as I now mix different web-frameworks but it seems to work like a charm right now. What is the best way to edit resource bundles using eclipse? How do ou structure your resource bundles without loosing track of things? After searching the web for a while, I finally settled for Eclipse Resource Bundle Editor. It works quite nicely, I just wish something useful like this would be built into Eclipse by default. class.AddUserAcion.success = The user has been successfully registered. Just as additional information: I wonder, whether it might be a cool thing, to be able to structure properties files similar to Rails 2.2+. There is an interesting RailsCast available about how to do I18N in Ruby On Rails. 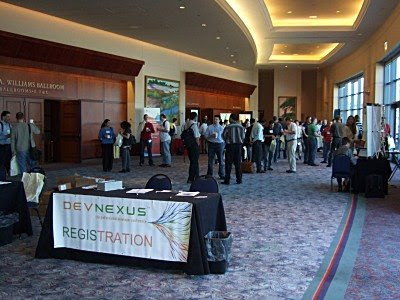 DevNexus is here—See you there! While reading Thomas Friedman's latest column in the New York Times, he pointed out the blog of Joseph J. Romm, which you can find at http://climateprogress.org/. It is an interesting blog that summarizes the latest developments regarding climate change. I use jQuery quite extensively in my projects these days, but I kind of ignored jQuery UI for too long. The last two days, though, I finally got more into jQuery UI, after I was looking for a modal dialog component and realized that jQuery UI provides a very nice implementation by itself. I was very much impressed about the way you download jQuery UI. They call it "Build Your Download" which let's you pick and choose which components of jQuery UI you may want to use and it creates a customized download bundle for you. But substantially more impressive is "ThemeRoller", which not only let's you select between various themes but also allows for editing and creating new themes. All changes are applied right on the spot and once you're done you can include the theme in your customized jQuery UI download. From there I discovered that jQuery released a new CSS Framework called "jQuery UI CSS Framework". It looks quite promising and I wonder if it might be applicable for my pet project. I certainly need to learn more about it...it would be nice if it could serve as the main CSS for my web application and therefore allow for easy theming of the application. There is also a themeswitcher component available. Lastly there is an interesting article on the blog of filament group, one of the main sponsors of jQuery UI, about styling buttons and toobars.